Meditation is a technique people use to improve concentration and aid self-development, but there tends to be some confusion about what meditation means and how it works. Discover a few frequently asked questions below about meditation to have a better understanding of the practice. Meditation is the act of entering into an altered, more focused state of consciousness. When meditating, you become more connected with your inner self as well as more aware of deeper aspects of your life and personality. On the outside, someone who is meditating may not look any different from someone just closing their eyes and resting. On the inside, a very special process is occurring. Meditation is about relaxation and examination of a person’s inner thoughts. 2. What is the difference between thinking and meditating? Meditation is not thinking. In fact, in many cases, it is the absence of thinking. That’s because meditation goes beyond the conscious processes that occur in your brain, such as thinking, and descends to a deeper level of your awareness. When you meditate, you let go of thoughts altogether. Your thoughts anchor you to your present reality and prevent meditation from taking place. 3. Do meditation techniques change as you go into deeper states? Yes. As you go into deeper states, you may find yourself using a mantra as well as practicing different techniques of self-actualization. People who achieve deep states while meditating can do so by using special meditation music known as binaural audio. Furthermore, deep meditation differentiates from routine meditation by its intention. Deep meditation goes beyond relaxation to uncover a deeper truth about yourself or the world and to feel connected to something greater. 4. What is the greatest thing about meditation? The greatest thing about meditation is the balance that it brings to your life. People who meditate report feeling calmer, more in control of themselves and more in tune with their true desires. People who meditate can form healthy relationships with the people around them and live better and more productive lives. Ultimately, meditating helps you feel connected with something larger than yourself. This connection can bring meaning and purpose to your life if you begin questioning why you are here or what you are meant to do while you are on this earth. 5. How do you know if you’ve had a successful meditation session? No two people have the same experience meditating, so it’s hard to say exactly how you can know if you succeed in reaching a meditative state. However, the main thing to keep in mind is that if you come out of the meditation session just feeling better — happier, healthier, more aware, less stressed, or whatever happiness means to you — then you meditate successfully. Don’t worry too much about achieving a specific “deeper understanding.” This deeper feeling comes with practice and time, and you don’t have to feel like meditation was a waste just because you did not enter a transcendental state. 6. What is the exact technique for transcendental meditation? Transcendental meditation is a very particular form of meditation that allows you to shed anxiety and achieve self-realization. Transcendental meditation started with an Indian guru known as Maharishi Mahesh Yogi, who founded an international organization to spread his technique. 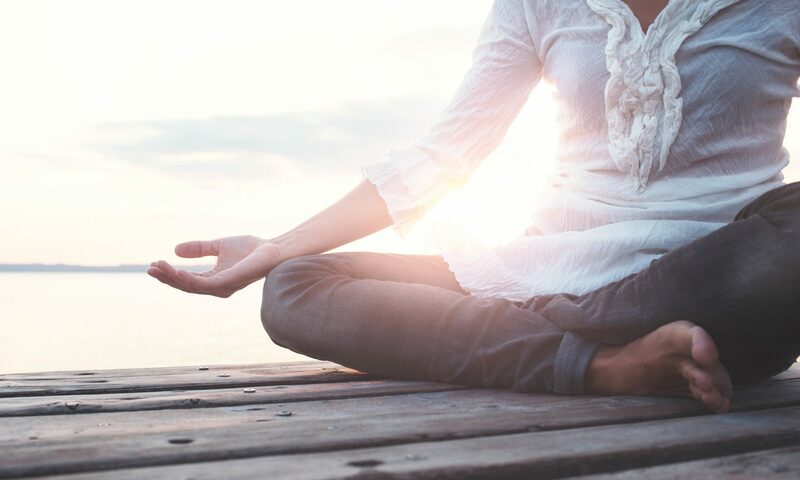 When practicing transcendental meditation, the exact technique involves sitting down with your eyes closed two times a day and repeating a mantra for 15-20 minutes at a time. This is supposed to help you transcend everyday concerns and worries and achieve bodily and spiritual harmony. 7. What do blue lights mean in meditation? Seeing colors when you meditate is not unusual. It has to do with the Indian concept of chakras, which many people believe to be spiritual centers in your body that allow energy to flow through and affect different parts of your being. There are seven chakras, each of which aligns with a certain color, and people believe blocked chakras may lead to illness in the part of the body that they affect. Seeing a particular color indicates that healing is occurring in that chakra. If you see a blue light, it likely means that the throat chakra, or Vishuddha, is experiencing healing. 8. How do you practice mindfulness (meditation)? Mindfulness is a common daily meditation technique that many people use when they find their lives becoming busy and overwhelming. Mindfulness meditation stems from a simple concept: taking the time to sit down, relax and just be yourself in your body without worrying about outside cares or struggles. Mindfulness helps you gain a better appreciation for what you have while letting go of negative energy in your life. It is easy to do simply by sitting down each day, closing your eyes and letting your mind empty itself of all thoughts to feel at peace. 9. Is the whole purpose of meditation practice to learn to use your “observing self” instead of your “feeling self”? It’s not the entire purpose, but the concept of the “observing self” can be helpful in understanding what meditation is all about. Entering an observing state allows you to detach yourself from reality and become aware of your awareness. Think of it as a type of daydreaming that can allow you to see different parts of your life as they truly are. This is different from your “feeling self” because you can examine your life from a deeper, more objective perspective rather than an emotional one. 10. How can I stop becoming bored while meditating? Many people report feeling bored or even falling asleep while meditating. The only solution to this is to be committed to avoid boredom and to practice putting this commitment into effect. If you try meditating, feel bored, and give up five minutes later, you have not committed yourself to making it work. Instead, allow yourself to feel bored but keep meditating anyway. Try to concentrate on letting go of all thoughts so that you can eventually let go of your boredom as well. 11. Can meditation ever be bad for you? By itself, no. The very idea of meditation is that it helps you feel more centered, more relaxed and happier overall. Some people either expect meditation to solve all their problems or become obsessed with achieving a deeper understanding. Both of these scenarios drive people to disappointment when they do not immediately get what they are hoping for out of meditating. As long as you don’t stress out too much over the minutiae of meditation, and instead focus on why the overall concept is important, you have a beneficial session that makes your life better and never worse. 12. Why is it so important to meditate? Meditation is important for several reasons, including physical health and spiritual well-being. Meditating can help you heal internal pains or imbalances, some of which connect to the seven chakras of the body as described earlier. Meditation can allow you to balance your internal energy and pinpoint problems in your life so you can solve them. Mentally, meditation brings you a sense of inner peace, fulfillment, and connection to a higher purpose as well as relaxation and a sense of release from what can often be a busy and stressful life. Many people who meditate can better concentrate and solve problems in their everyday lives. 13. What is the best way to meditate? There is no one best way to meditate, as there are many different techniques that people use to find success in their ways. However, many people use a very simple technique to meditate: finding a peaceful spot, getting comfortable and being present. This involves sitting down, closing your eyes and letting go of wandering thoughts instead concentrating on your body and your awareness of your self. Eventually, this allows you to feel a sense of inner peace and comfort. 14. How does meditation help? Meditation has some incredible benefits, and they don’t stop with self-awareness. People who meditate experience lower blood pressure and fewer health problems as well as a greater sense of intuition and understanding of how to solve problems that they experience just going through life. People who meditate can form healthier relationships with people and experience mental peace, happiness and self-confidence. This can improve all aspects of a person’s life and overall sense of well-being. 15. How does breathing meditation improve awareness? Breathing is a crucial part of meditation because it helps center you in your body. When you sit down and concentrate on your breathing, you become more aware of your body and the different parts of yourself that come together in one being. This focus helps with the physical health aspects of meditation that can allow you to heal different areas where energy might be blocked. Breathing meditation also allows you to let go of any wandering thoughts by concentrating your mind on feeling your breath coming in and out, which is a great technique for keeping your mind focused and at peace. Finally, focusing on your breathing also allows you to control it and slow it down, which in turn helps you to relax as your heart rate starts to go down.